It was February 2001 when I became pregnant for the first time. That baby is now 17 years old, and probably leaving home in less than a year. Since that day in February when I first conceived I have been either breastfeeding, or pregnant, without any pauses, for 18 years. I was always pregnant with another by the time I weaned the child who was nursing. It's not like I planned it that way. It just sort of happened. I was committed to extended breastfeeding, and I just kept getting pregnant before I'd had time to wean the previous child. So the new baby became the catalyst to wean the older sibling. All that to say, I'm done! 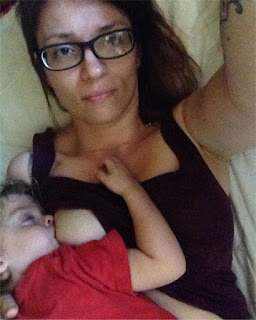 A month ago my youngest, just before turning 3, stopped nursing to sleep, and I am no longer lactating. My body is no longer nourishing an extra person, for the first time in 18 years! Yes, I'm repeating myself. I'm not sure you get the significance of it.